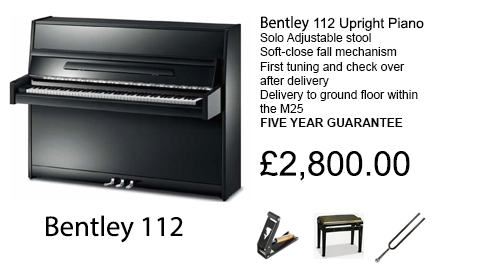 Our Bentley Promotion is not only an excellent choice for a newcomer but also for a more accomplished player on a modest budget. The Bentley 112cm model is a good quality upright made in the award winning Pearl River factory in China. Built on European traditions and containing high quality woods and action parts, we are confident that this instrument will see you and your child through the majority of the grades.